exceptional interest and beauty NEW ! 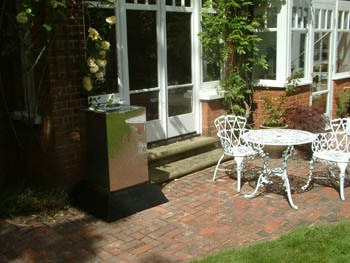 This beautiful sundial water feature is a joint development between Spot-On Sundials and Privett International. 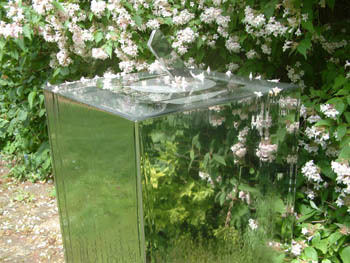 The water feature is a very simple sheer square column of stainless steel, with the water pouring continuously over all 4 sides. 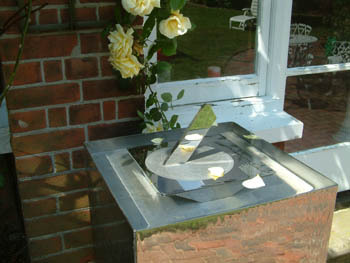 The sundial is fixed so that its top surface is very slightly higher than the water level. The result is magic! The sundial gnomon (which casts the shadow) appears to be "floating in air"because you appear to be able to see straight through it. The water curtain gives a constantly moving image which is both fascinating and relaxing. 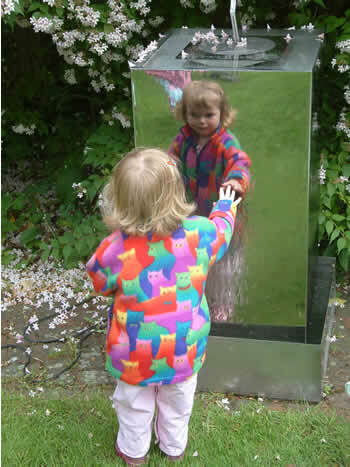 There is a feast of different reflections from the water surface, from the stainless steel column, from the dialplate of the sundial, and from the gnomon. These elegant and robust dials incorporate the split gnomon, so that every day at solar noon a line of light will shine through the gnomon along the noon line. 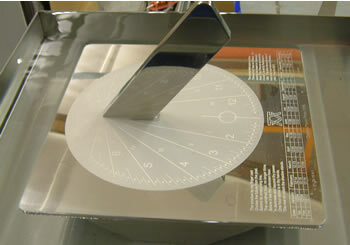 The dial plate with 10 minute lines and 5 minute spots is matt, to ensure a really sharp shadow. 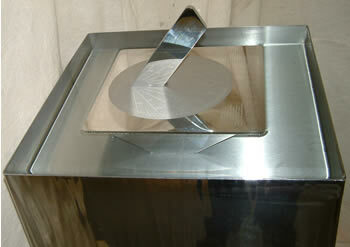 The remainder of the dial plate and the sides of the gnomon are mirror-finished. This gives rise to some interesting reflections, both of the sky above and the near side of the matt dial plate, so that the gnomon from some angles appears to be suspended in space. 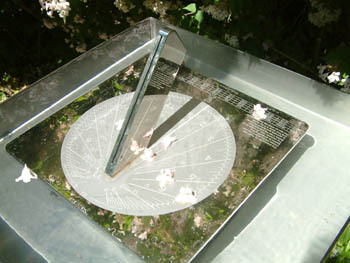 There is a space for special engraving in the 8 x 34 panel at the foot of the dial- plate - the engraving can incorporate mottoes, dedications, and information about the sundial, according to the choice of the client.